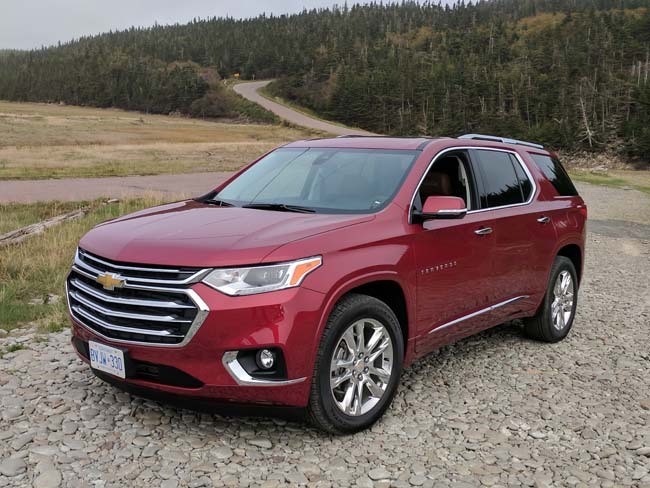 The 2018 Chevrolet Traverse has been fully redesigned from the tires up, but sticks to a pretty consistent game plan. Give the people what they want — a large, safe people hauler. The exterior dimensions of the new traverse remain virtually the same, although the wheelbase has been lengthened by two inches. More interior room is one benefit; the other is a smoother ride. Despite the longer wheelbase, the new Traverse is up to 500lbs lighter than the outgoing model. The mid-sized Chevy Traverse CUV seems larger than the category label would suggest. 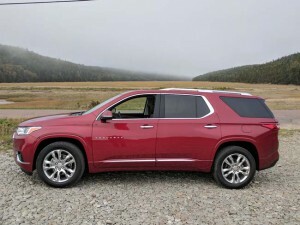 During the initial press presentation, an image of a Traverse with tinted windows was shown — the visual similarity to the full-sized Chevy Suburban was uncanny. Exterior styling carries over Chevrolet’s clean, sharp line design. It’s a handsome, almost utilitarian, effort and a welcome approach to CUV design. The restraint from designers is to be commended. Sporting three rows of seating, the 2018 Chevy Traverse offers either seven-passenger seating on most models, with an eight-passenger configuration on available on the entry-level LS. All three rows of seating have generous shoulder and legroom. Chevrolet claims best-in-class passenger volume and best-in-class third row legroom. Access to the third row is via the folding middle row seats — the seats stay relatively upright but slide forward enough to allow easy entry and exit. Young families will appreciate the middle row seats staying upright, as it means not having to remove child car seats when someone wants into the third row. A lack of cargo room or rear passenger headroom is a common complaint with most three row CUVs — the 2018 Chevrolet Traverse avoids this pitfall. Despite extra room for the passengers, buyers will find a surprising amount of storage room (651 litres) behind the third row seats. With the rear and split folding second row seats folded down the Traverse provides 2,789L and has 48-inch wide flat floor. Chevrolet has simplified production options for the 2018 Traverse. There will be five models with a small variety of packages. An entry level LS model comes as a front-wheel drive model with cloth covered seats, but includes features like keyless ignition and passive entry, rear view back up camera, 18-inch wheels, automatic climate control, Chevrolet Mylink, steering mounted phone and audio controls, a seven-inch multi-function touch screen, colour LCD monitor, heated outside mirrors as well as OnStar 4G LTE Wi-Fi hotspot for up to 7 devices (subscription required). The next step up LT trim level is what Chevrolet sees as the sweet spot in the sales forecast. Additional standard equipment includes trailer towing package, seven-passenger seating with middle row bucket seats, heated front seats with an 8-way power driver’s adjustment, power lift gate, rear park assist and blind spot monitoring with rear cross-traffic alert. The Traverse initially comes with one engine choice. The 310 horsepower, 3.6L engine used in other GM products and paired with a nine-speed automatic transmission. The engine is popular with designers as its reliable, relatively powerful and smooth. The package is good to tow up to 5,000 pounds. A 2.0L turbocharged in-line four-cylinder engine will be coming in an RS-badged model that will only be available in front wheel drive. The towing limit for the four-cylinder package is 1,500 lbs. Front-wheel-drive will be standard on LT and LS models. All-wheel-drive is available on both. A raft of new technology is available on the new Chevy Traverse. Connectivity with Apple CarPlay and Android Auto is available, as well as the OnStar 4G LTE hot spot technology. Out in rural New Brunswick, the roof mounted cellular data system proved valuable, as the roof surface and raised position of the antenna appeared to pull in better signal than what we had on our cell phones. Another interesting feature is the back-up camera appears in the rear-view mirror. Lifting the lever that typically dims the headlights from the rear activates a system that converts the mirror into a panoramic LCD screen showing everything to the rear — it does away with the blocked view usually seen because of the headrests. Its odd how much more natural this rear view system seems than staring at a dash-mounted screen. While looking back for direct observation is ideal and preferred, when the back window is blocked for some reason, this system is then next best thing. 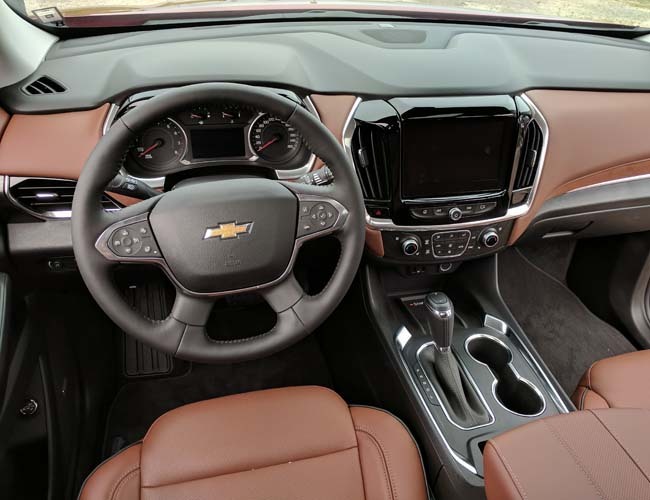 As recently reminded in our local news, Chevy’s standard rear seat reminder can prove invaluable if you happen to forget a sleeping child or animal in the back seat. One enlightening feature is the hands-free power tailgate. The vehicle will sense the key fob and project the iconic Chevy Bow Tie onto the ground under the rear bumper. Wave you foot over the projection and the rear gate magically opens. The AWD system on most Traverse models features a single clutch system that shuttles the power between the front and rear wheels as needed. The top of the line High Country model adds an additional clutch that splits power between the rear wheels. The system helps handling in corners by sending power to the outside rear wheel. The AWD systems can be switched on or off via a console mounted rotary knob. As the system operates in front-drive until needed, the typical AWD fuel penalty is minimized. It’s not a bad idea to leave the Traverse in AWD for those situations when you might need it — use front-drive in summer and AWD during the fall and winter months. Another neat feature on most models is the hidden cavity behind the eight-inch LCD multi-function screen. The control can be PIN protected to store valuables. And should you forget your PIN you can have a reset emailed to you. On the road the Traverse is very quiet. The engine and transmission are smooth and the seats are supportive and comfortable. We drove over a variety of roads, including paved highways, pothole roads, city streets as well as rural dirt and gravel roads. The new chassis passes the off-road test with flying colours. There were no rattles or creaks evident on our testers. We drove three trim levels — the base LS, a Red Line LT, as well as a top of the line High Country. All proved to be comfortable, quiet and a pleasant way to cruise along the coastline of New Brunswick. 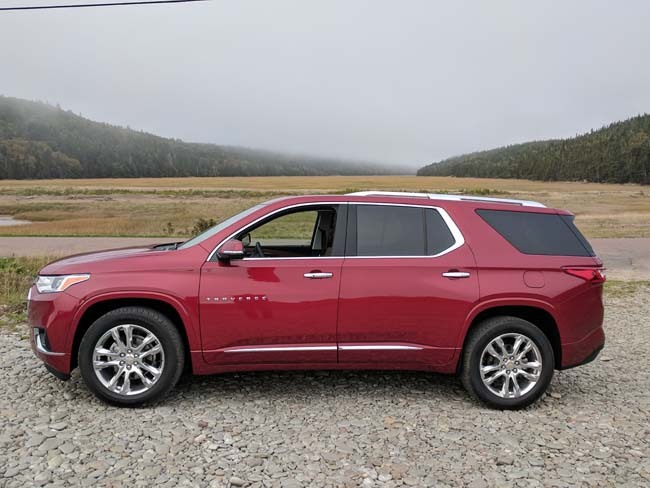 Naturally there are more creature comforts in the High Country, but it comes in at a cost close to $60,000, a figure that even GM realizes will lead to limited sales. 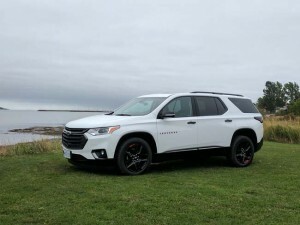 The 2018 Chevrolet Traverse starts at $36,790 for the front-drive LS model, all-wheel-drive is a $3000 option on this or the front wheel drive LT ($41,090). Interestingly, Chevrolet has priced a Traverse LT AWD within a $1 of a 2018 Ford Explorer XLT AWD, but claims it comes with substantially more standard equipment, a more powerful engine and more safety features. It’s a very competitive segment that just got more interesting. To see specific pricing and trim levels visit Chevrolet’s website.